If you have a working legacy phone system, and want to take advantage of the monthly savings of an internet based phone service without having to upgrade your existing systems, then this option will fit your needs. 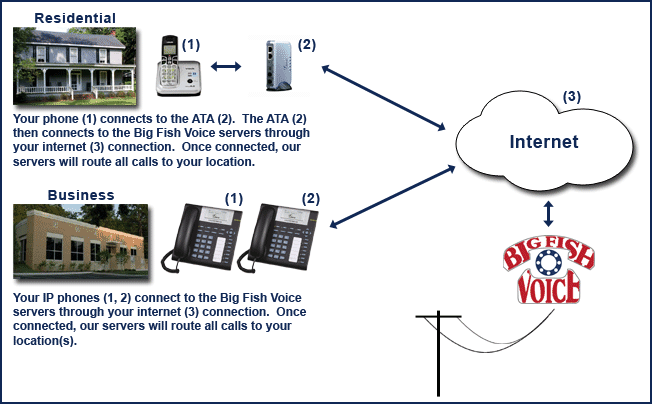 While leaving your existing system as it is, Big Fish Technologies’ Analog Telephone Adapter (ATA) will replace your existing hard line copper phone line(s) and connect to your phone system just as the legacy lines did. Our ATA then connects to your internet connection to create a direct connection to our Hosted PBX datacenter servers. The Hosted PBX servers will then route calls to your location(s) using the ATA device. If your business phone system is a VOIP phone system, then no new hardware is needed. We can connect directly to your phone system with zero downtime. If your phone system is dead, dying, or just plain needs an upgrade, then this option will fit your needs. Your old phone system would be replaced with the newest technology in IP Phones. The IP Phones then connect directly to our Hosted PBX datacenter servers. The Hosted PBX servers will then route calls directly to your IP Phone devices. Because the IP phones connect directly to our servers, there is no need to purchase an expensive phone switch for your location. Honestly, we can’t think of any. Setup is easy. Connect the Big Fish Technologies Analog Telephone Adapter to your broadband internet connection. Then connect your corded or cordless phone to one of the two phone ports on the back of the adapter. Once connected, the adapter then creates a direct connection to our Hosted PBX datacenter servers. The Hosted PBX servers will then route calls to your home. You will then be able to send and receive calls like you normally would.